Thirty-one year old Westley Chow looks comfortable in joggers and a red workout shirt. Sipping coffee from the shop next door, he surveys his studio gym, UpFit Training Academy. Low rap music thumps in the background. Both Chow and his business partner Paul Park are trainers and owners of UpFit, a small private fitness gym located in Midtown, Manhattan. Currently, they have approximately 60 clients. Their strength and conditioning program is not for aesthetic reasons--this differentiates them from other fitness clubs. Westley states their program is focused on equipping people with the fundamentals of fitness in order for them to be able to live a healthy life. Based on seven core values: compassion, adaptability, resilience, courage, responsibility, integrity and communication, their approach addresses the “whole” of life. Chow and Park believe through training groups of four, clients experience community, inspiration and improved fitness. “When others are working out hard around you, it’s hard to say no. This forces them to be autonomous and take ownership,” Chow said. According to the Atlantic, the popularity of fitness “cults,” are on the rise. As an increasing number of people identify as “religiously unaffiliated,” according to the Pew Research Center, the gym seems to have taken the place of the church for many. Gyms offer routine, community, ritual, socialization and real relationship. With the “seven values” as the foundation, UpFit Training Academy offers an appealing community. With the booming global fitness and health club industry now valued at $80 billion in annual revenue according to Statista, Upfit Training Academy can afford to be selective. Program pricing is between $289 to $2,000 per month depending on level of service. This is industry standard for private health and wellness businesses. This is a booming industry grossing $4.2 trillion and growing at a rate of 12.8 percent over two years, according to the Global Wellness Institute. The health and wellness industry now represents 5.3 percent of the global economic output. With $595 billion spent on fitness, Americans are investing in health. 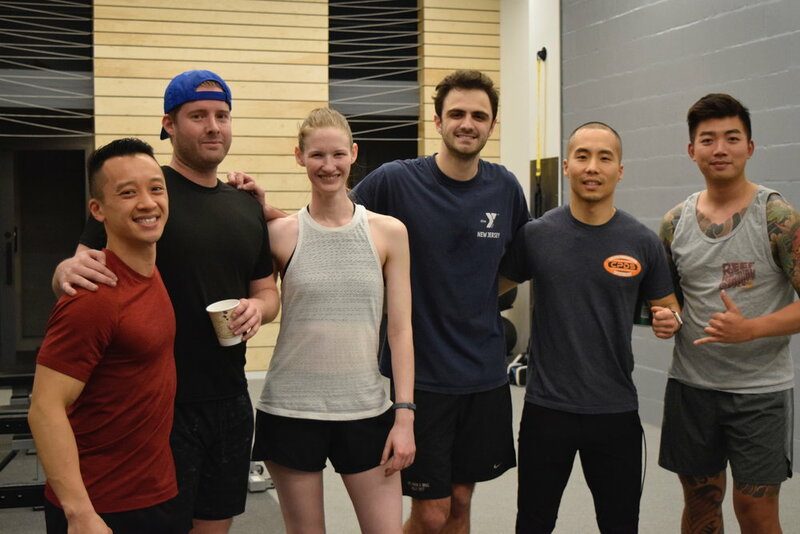 In New York City, personalized fitness draws certain types of people-- clients from finance,business and other professionals. The average age of UpFit’s clientele fall within a wide range-- 20 to 50 years old. Chow admits the average client salary is more than $100,000 a year--55 percent higher than the national average, according to Bureau of Labor Statistics. With high fixed costs approaching $15,000 per month, and UpFit’s revenues at $31,000 a month, continuing growth is necessary. To have available capital, Chow and Park have a nine year business loan with a rolling renewable option. UpFit’s “European-style” gym fits the bill for its upscale clientele. Soft natural light combined with their branding colors of green and white accent the room. Multiple personal touches enhance the workout experience. The space is minimal, but contains all that is needed. “We’ve only been here two weeks,” Chow explains. The official opening is later in February. Starting on their journey less than two years ago, Chow and Park are beginning to attain their dream. Graduating with a degree in Nutrition and Exercise Science, and a few semesters of an MBA at Baruch College, he realized he could pursue his dream-- his own gym. Life-long friends with 25 years of experience in the industry, Park and Chow reconnected and began working together. “We realized that our lifestyles and values are aligned enough to work and hey, we can do something here,” Chow says. Despite a lengthy and renovation phase, they remain cash flow positive. “It definitely brings on a lot of stress,” Chow said. “Paul reminds us that we are going to be okay.” This has been necessary because they have had over $100,000 of unanticipated costs plus cost of living and the gym’s monthly rent. “Neither of us are afraid to put in the hours,” Chow says. He says they clock over 100 hours a week. “We keep going when others want to take a break. We just go harder. [Because of that] we are making gains slowly and steadily,” Chow said. The pair runs social media accounts (Instagram and Facebook) to increase community engagement. As far as They are also responsible for maintenance as well as other marketing endeavours (such as text campaigns, health fairs and donations to private schools) take most of their non-training time. According to Chow, their highest variable costs are advertisements. Agency retainer costs $1000 a month. Yelp costs up to $1000 a month. Paying for referrals--“gorilla” marketing-- costs $200 upfront, but the potential lifetime value is around $5000. Their business and marketing strategies work. Not even officially open, they added 16 new clients in January. By the end of this year, they plan to open another facility with a franchise as the goal. Chow projects $1.2 million in gross revenue by the end of 2019. Even with direct competition from private gyms in the area, such as Fort or Catalyst, Chow and Park aren’t worried. They believe the fitness experience at UpFit Academy is unique.